Burglaries in the USA dropped by 7.8 percent last year, according to the FBI. That's great news. Despite the drop, however, there were still more than 1,500, 000 burglaries last year; three quarters of them at residences. We think that's way too many. So we looked at the data and highlighted some insights that can help you lower the chances of your home being one of them, and make your neighborhood safer and safer. One in three residential burglaries are simple "unlawful entries", which means entering the home via an unsecured window, front door or other potential entrance. It's easy to accidentally enable this type of burglary by forgetting to lock up when you're in a rush. 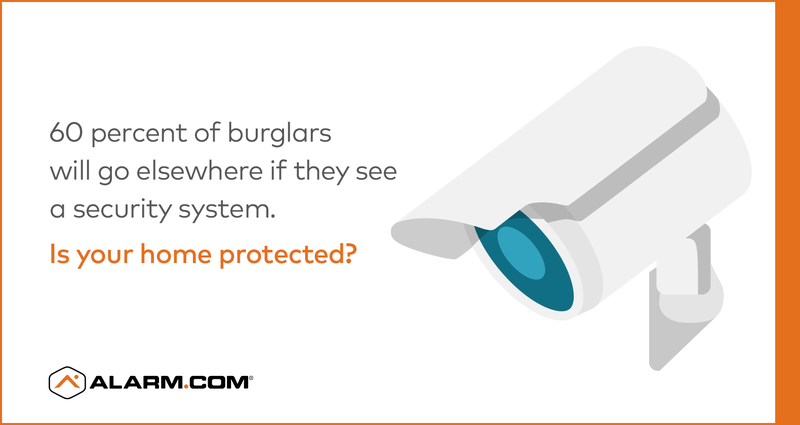 Forgetting to lock up doesn't have to mean that your home is vulnerable. 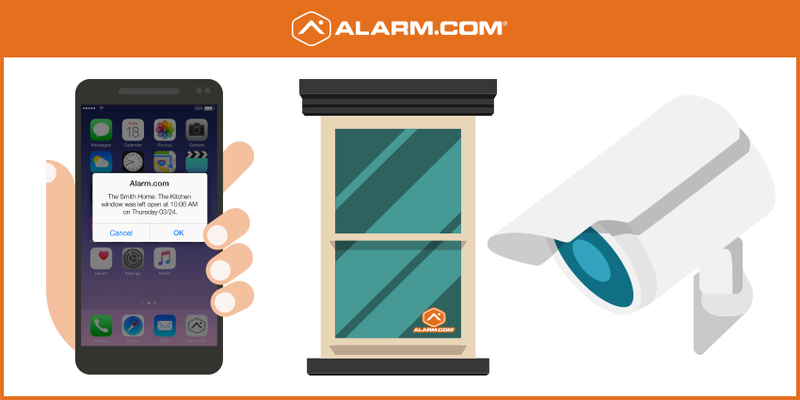 A smart home security system powered by Alarm.com sends an actionable alert to your smartphone if you leave an entrance unsecured. 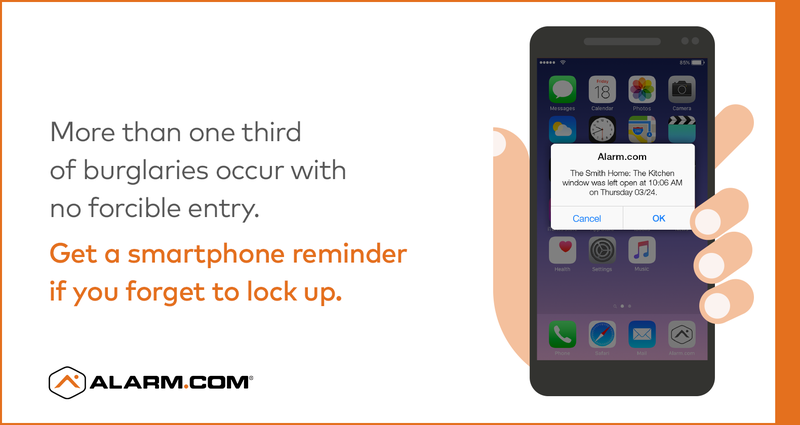 You only need to tap the reminder to lock your smart lock, close your garage door, or arm your security system. Related: How to secure your home in a single touch. 2: Burglars wait until you go to work. 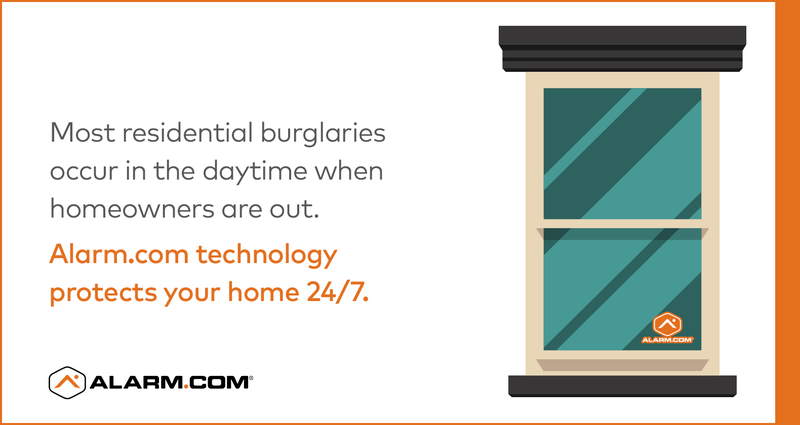 To reduce their chances of being detected, burglars tend to work similar hours as you do. Most residential burglaries happen during daytime hours, when houses are unoccupied and unprotected. With Alarm.com, you can know instantly about unusual activity at home when you're not there, and even see what's happening. Motion-triggered image sensors and security cameras send you smartphone alerts that show you exactly what's going on. You won't simply know that someone is on your porch; you'll be able to see whether it's a package being delivered, or something more suspicious. If you have a video doorbell, you can even talk to whoever's there. You won't be the only one guarding your home, though. Alarm.com-powered security systems are professionally monitored, 24 hours a day. If there's a break-in (or fire) at your home, your system will signal for help and a security professional will dispatch police to your home immediately. …and they hate security systems. According to one study of convicted burglars, 83 percent said that they checked for security systems when targeting homes, with 60 percent saying that they avoided homes with a security system altogether. If they discovered a security system during the course of a burglary, 87 percent said they would always or sometimes retreat. Installing a smart home security system is an easy and highly effective way to protect your home. Of course, Alarm.com's security technology does more than simply deter. Our dedicated cellular connection ensures that your system can signal for help even if your phone or broadband line is tampered with. Crash and smash protection ensures that even if your panel is disabled, help will be on the way. Related: How smart home security fights crime. With the average dollar loss caused by a burglary running at more than $2,300, smart home security is well worth the investment—especially with its additional benefits including discounted homeowners insurance, energy savings, and a full array of convenient smart home technology. To find out how to get Alarm.com for your home, click here.